There is (another) place in New Zealand that has captured my heart. Piha is one of the loveliest places I’ve ever been. Sure, the views are great, but it’s vibe that drew me in. It has a totally relaxed, comfortable feeling about it. I will admit, I was in a rather emotional state when I visited Piha. I was travelling with someone who I generally don’t get along with, which always makes for interesting travels, and this was only the beginning of a 4-week journey. 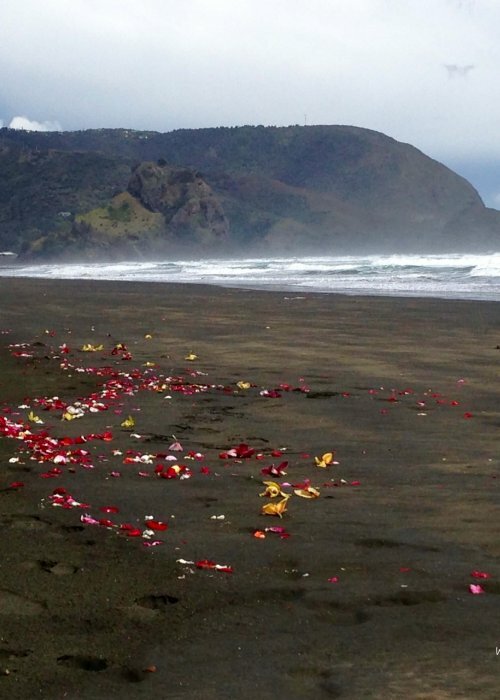 As I gazed upon rose petals covering the beach from a recent wedding, enjoyed seeing children rolling down the black sand dunes, giggling in delight as waves ferociously hit the beach, watched as surfers negotiated the forming waves at the break. With every vision, a curious feeling swept over me. Piha touched my soul, calming me. It made me appreciate everything around me and allowed me to ignore the rest. I knew then it was a special place. It set me up to continue with the journey that lay before me. So where is this magical place, and why should you visit it? Piha is just west of Auckland, over the Waitakere Ranges. If you have a rental car or campervan, it’s an easy, but somewhat windy drive through the tropical bush. From Auckland, you follow Highway 16 to 13 where you will find a quaint beach community on the other side of the ranges. 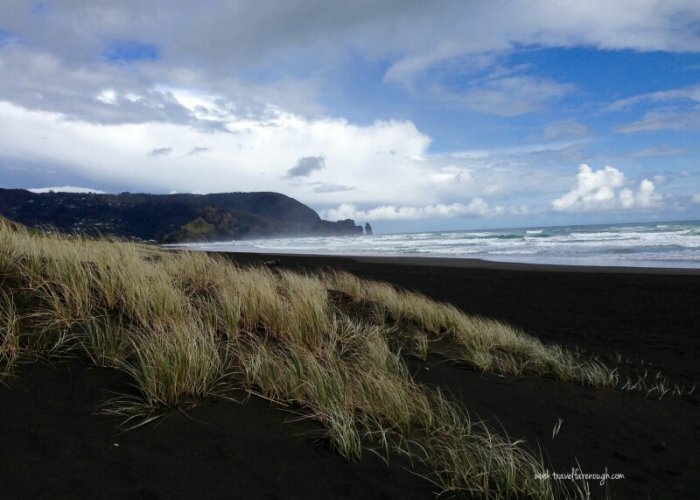 It is an easy drive from Auckland – about 45 minutes – but to really get a feel for Piha, I recommend staying a few nights. It is a soothing, relaxing place to be, even in the height of summer. and it’s a stones throw from Auckland. Lion Rock – Do you see it? There aren’t many overlooks along the way, but definitely take in what you can. It was only from above that I understood why Lion Rock was so named. I couldn’t see it from the beach. 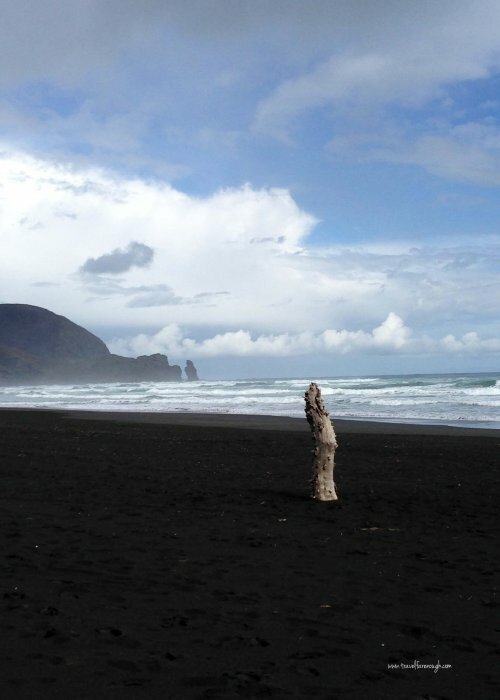 When you reach the bottom of the range, head toward the beach and dig your feet into the black volcanic sand. It’s very fine where it’s dry and clumpy when it’s wet. Either way, it’s magical. One note to add, in summer, the sand is scorching hot, so take your thongs/flip flops with you. In Piha, Lion Rock majestically stands before you. While you can climb Lion Rock (there is a Måori carving up top), it’s not advised when it’s wet. It can get pretty slippery. But if you are up for the challenge, go for it. 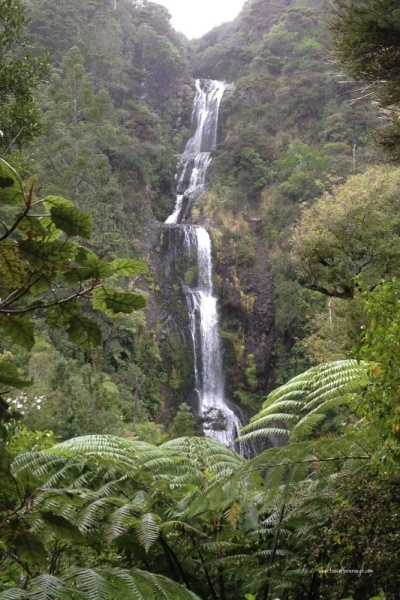 Kitekite Falls – worth the walk. Even without climbing Lion Rock, there’s so much here. Nestled into the mountains is Kitekite Falls. The walk, the trek, the falls – all are gorgeous and worth the time to make this trek. 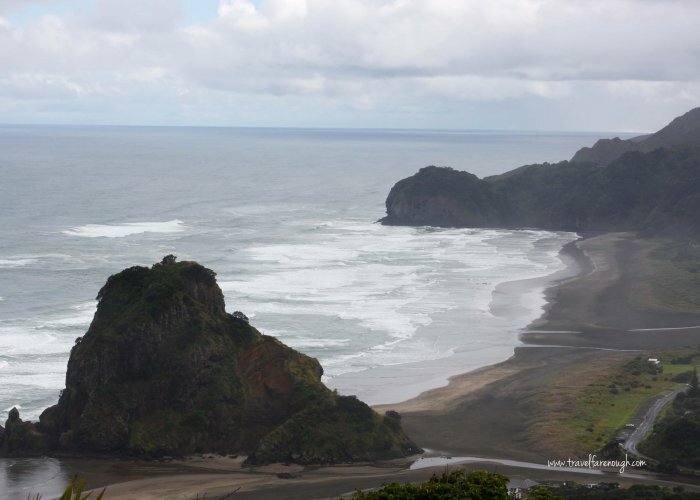 To get to Kitekite, take Glenesk Road off of Piha Road and drive to the base of the mountains. It is a hike to get to the falls and and about an hour each way but it’s definitely worth it. There is a small incline about hallway along so take some water and a snack. Most importantly, take your time. Oh, and take your camera! 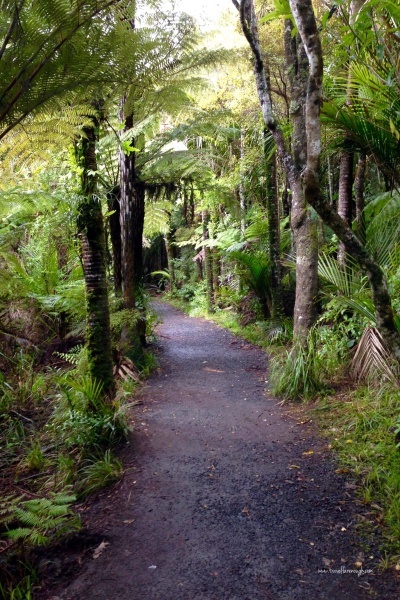 After that adventure, head to North Piha to the end of the road, park your vehicle and follow the trails to the caves. Kids LOVE it here (well, adults do too!). See what you can discover. 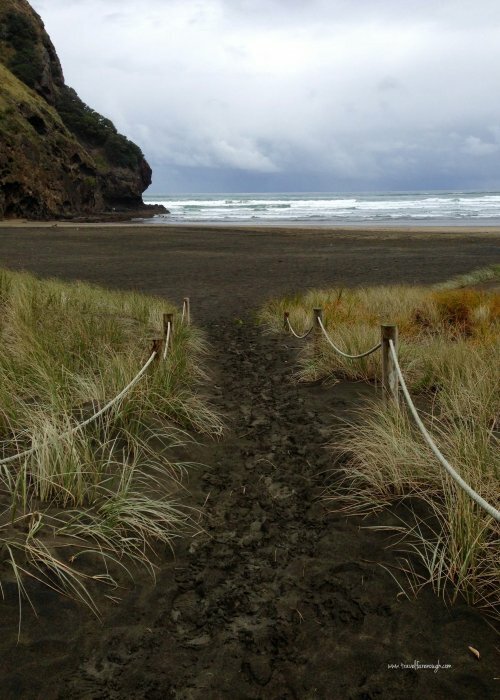 But wait, there’s more to Piha! Grab a coffee from the café and head back on Piha Road. Take the right turn to Log Race Road. It becomes a dirt road, but don’t be deterred. At the end, you will find a secret spot: The New Zealand WWII Piha Radar Station. If you’re a history buff, this is a great place to explore. Even if you aren’t, the views are worth the stop. 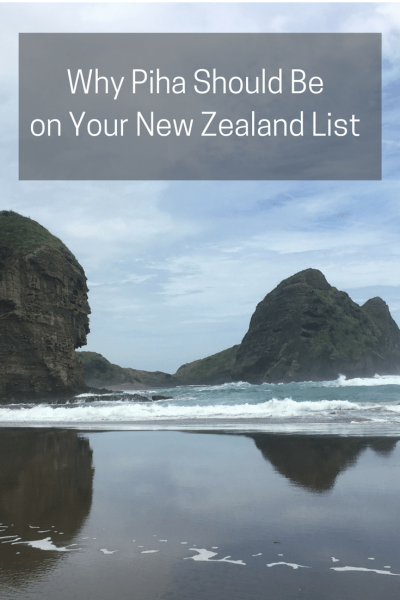 Because you are going to Piha, right?! Set above the village, this stay has amazing views that provide stunning sunset photo opportunities. Kick back and enjoy the relaxed atmosphere just being here provides. It’s truly a stunning getaway, whether it’s for a ‘romantic getaway’ or simply because you want some peace and quiet for a while! Situated at the end of Piha Beach, A Beach House at Piha is a beachfront holiday home with air conditioning, free WiFi, and parking, featuring 180-degree views of the ocean, soft sand and rugged, natural coastline. The property is only 20 m from the beach. This is more of a homestay type of accommodation with private rooms and a shared kitchen. A terrace or balcony are featured in certain rooms. The beach is just about a ten-minute walk and WIFI is available throughout. I will return to Piha someday. 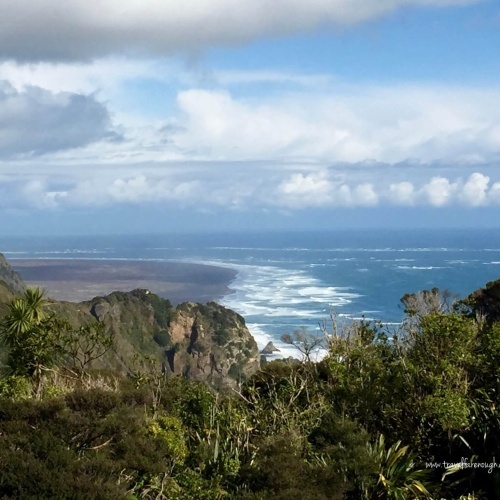 UPDATE: In 2018, I put Piha on my list for the end of my New Zealand journey on of my Worldwide Solo Trek. I went to see if it had the same essence as that first trip. It does. I dipped my feet into the soft black sand and let the cool water rush over my feet. I explored it in February, high season in New Zealand, and while the town was busy, it was not intrusively so. I could wander without anyone nearby and take as many photos as I wished without anyone in them. This is truly a special place I recommend for any Auckland itinerary. I imagine renting a place and staying awhile. Maybe to write a book? Florence. Charming. Genius. Passionate. Atmospheric. Next Post This Is Not Your Mama’s Embassy Suites!